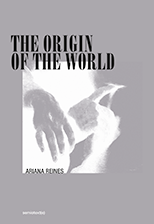 Ariana Reines is an American poet, playwright, performance artist, and translator. Her books of poetry include The Cow (2006), which won the Alberta Prize from Fence Books; Coeur de Lion (2007); Mercury (2011); and Thursday (2012) Her play Telephone was commissioned and produced by The Foundry Theatre, and presented at The Cherry Lane Theatre in February 2009. Number 6 in a series of 22 publications produced on the occasion of the 2014 Whitney Biennial.